7 Reasons Why Bohol is My Favorite Island in The Philippines. 1) There is a pool table and hammock in every village house! I’ve witnessed laid-back island life in many places, but Bohol’s refreshingly relaxed vibe is different. You don’t need to go to a beach here to see people lazying on the sand with beers and music. Most houses on the island, whether by the farms, along the river, or in the hills, have pool tables and hammocks in their backyards. Driving along the island’s lush interiors, I saw locals swinging on hammocks outside their houses, and entire families (often the mothers leading the troupe) bantering over friendly games of pool. C’est la vie! 2) The Chocolate Hills are as fascinating as their name. The chocolate hills of Bohol. 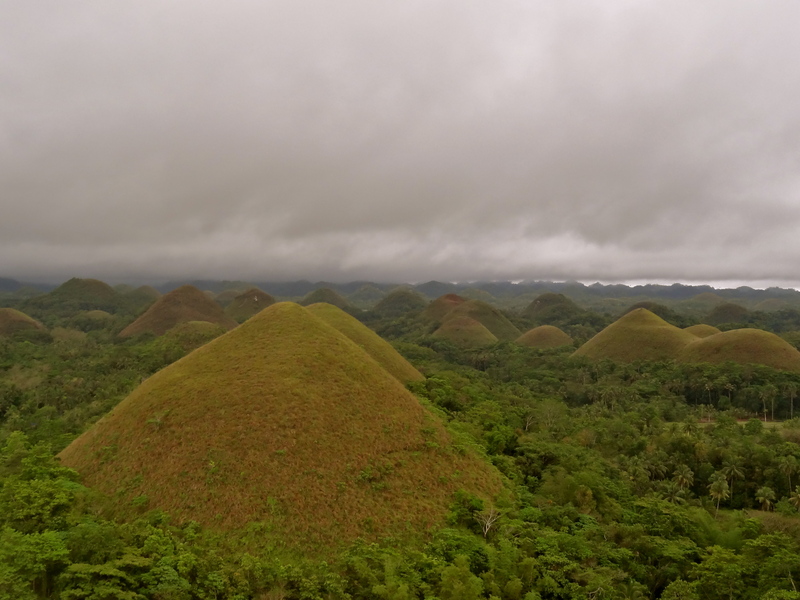 Witnessing the Chocolate Hills of Bohol is the next best thing to actually being covered in mounds of chocolate – a cluster of thousands of limestone hills perfectly carved by the wind in the shape of Hershey’s kisses, from which they get their name. A volcanic eruption many years ago made these hills surface from below the water. We climbed up to the peak of one hill, and found ourselves surrounded by a mesmerizing view of countless life-size Hershey’s kisses at sunset. I only wished they would melt at my touch. 3) It is the only remaining home of the Tarsier. Meet the Tarsier, one of the smallest primates on earth, which has been wiped away from parts of Indonesia and the Philippines, to only be found in two wildlife sanctuaries in Bohol. This fascinating alien-like creature sleeps during the day, crawls in the forest to look for insects at night, lives up to 25 years in the wild, and is close to being endangered. 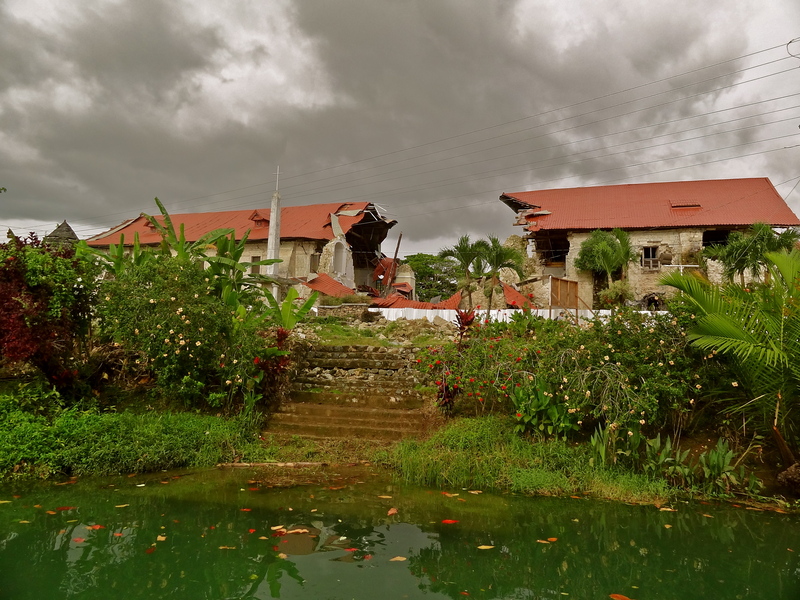 Go before its too late, and contribute to its conservation efforts in the village of Loboc. 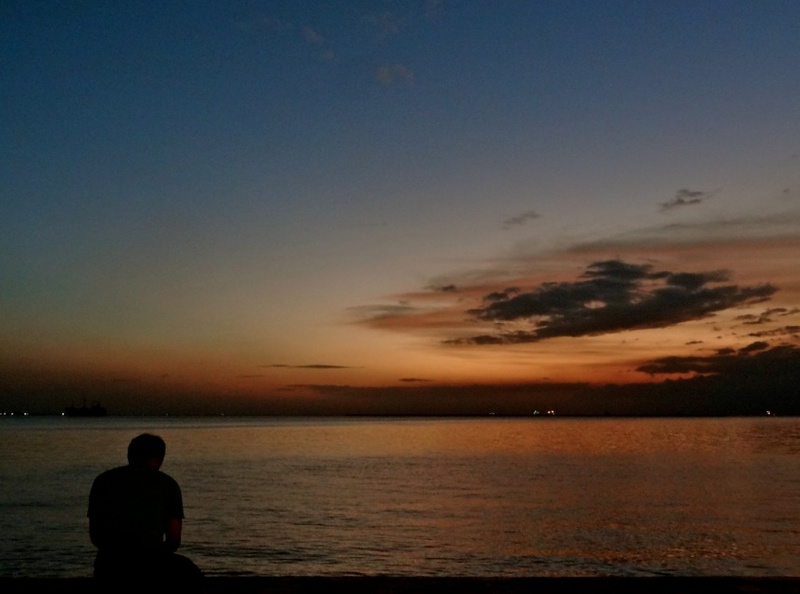 4) A massive earthquake rocked Bohol, but the locals have moved on. Bohol church. It took man 5 years to build it, and nature 15 seconds to destroy it. It’s the job of media channels to show you devastating images and convince you that Bohol is out of bounds after a major earthquake hit it in 2013. They’ve done their job well, because tourism on the island has suffered terribly in the last few months. But it’s my job to tell you that Bohol is indeed, safe to visit. As safe as the rest of the Philippines anyway, because the entire country falls in the Pacific ring of fire and is prone to earthquakes. We saw churches that took 5 years to build, 500 years ago, broken in half by 15 seconds of the earthquake. And we admired the spirit of the locals who rebuilt their lives and moved on, even renaming the earthquake-affected chocolate hills to “vanilla hills”. 5) You can go stand-up paddle boarding along a river full of fireflies. This is what SUP-ing in Bohol looks like. Photo by Sup Tours. One awesome thing at a time. 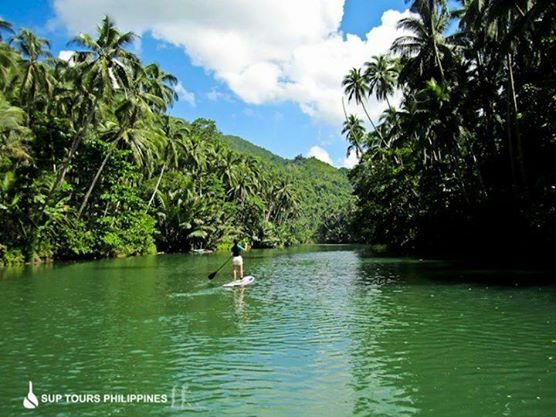 I went SUP-ing (Stand Up Padding Boarding) for the first time on the Loboc River in Bohol. I traversed this vast expanse of gentle backwaters, surrounded by coconut and banana trees and quaint village homes, in the dark of the night, under a starry sky. And surrounding me were trees laden with fireflies, shimmering brighter than the stars! It was an experience I’m never going to forget. 6) They actually offer local vegetarian food. Sampling veggie curries with fried rice. 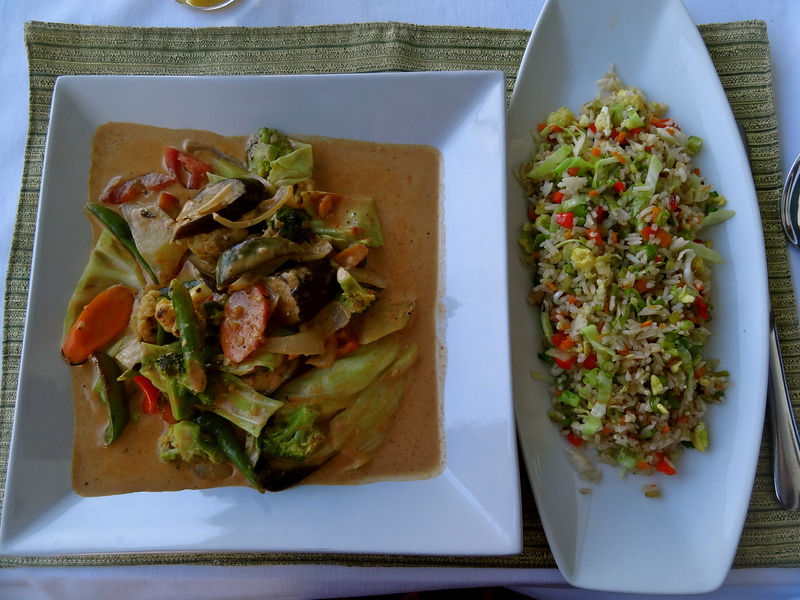 Bohol gave me my first taste of delicious local vegetarian fare, cooked with much love and creativity. Appetizers rolled with eggplants, seasonal sauteed veggies, and delicately spiced local noodles awaited me at meal time here. Then, as luck would have it, SUP-ing led me to a small guesthouse run by a Dutch-Filipino couple, who actually offer local vegetarian food as part of their menu! If you follow me on Facebook or Twitter, you know that I was subjected to some nasty food experiences during the Philippines trip. Bohol made up for it with dishes like the mongo and sumptuous veggie curries. Also don’t even get me started on the mangoes in Bohol. 7) The underwater world is stunning. 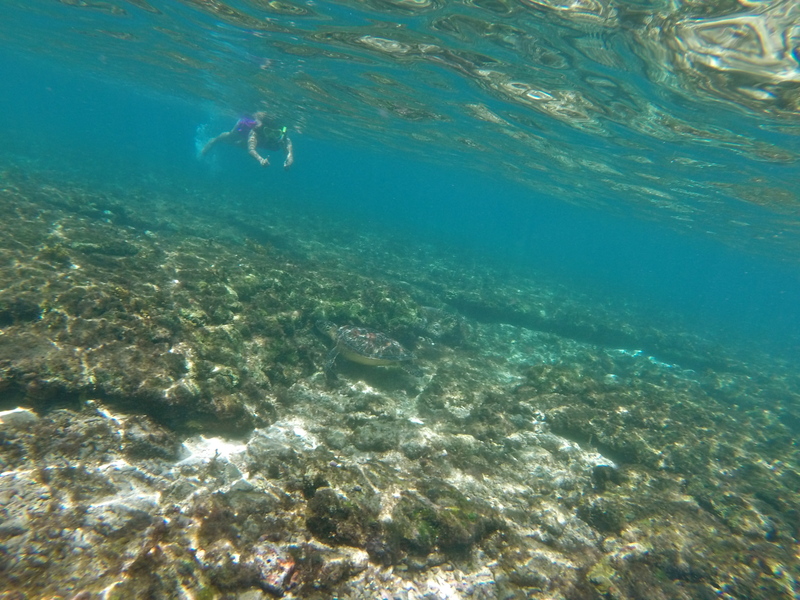 Snorkeling with sea turtles in the Philippines! I suppose that’s true for most of the islands that make up the Philippines, but Bohol is where I could drive a two wheeler from the lush hill countryside, to the Loboc river, down to a pretty white sand beach for snorkeling among colorful corals and fish. I didn’t get to do it myself, but I hear that the island is a haven for dolphin and whale watching. Oh well, I’ve found my excuse to go back to Bohol soon. If I were to pick just one island to visit in the Philippines, Bohol will be it. What about you? Join The Shooting Star on Facebook, Twitter and Instagram for travel stories from around the world. Indeed is, Mani! Planning a trip? Enjoyed the article and your others on how to live a life traveling. That’s my aim as well. Who wants to work a corporate job? I hope you get to soon! Hope to get to visit it soon, Shikha! Awesome place… Thanks for sharing the info!!! Bohol does sound good – Especially the chocolate hills! I also love the idea of hammocks in every backyard. Life is great there, it seems. Iwill pick nearby island to Bohol, Siquijor Island.This island is an amazing place to visit with its beautiful waterfalls,beaches,etc.There is only one main road around the island and it can be explored by motorbike. Wow, I’d love to visit Bohol. 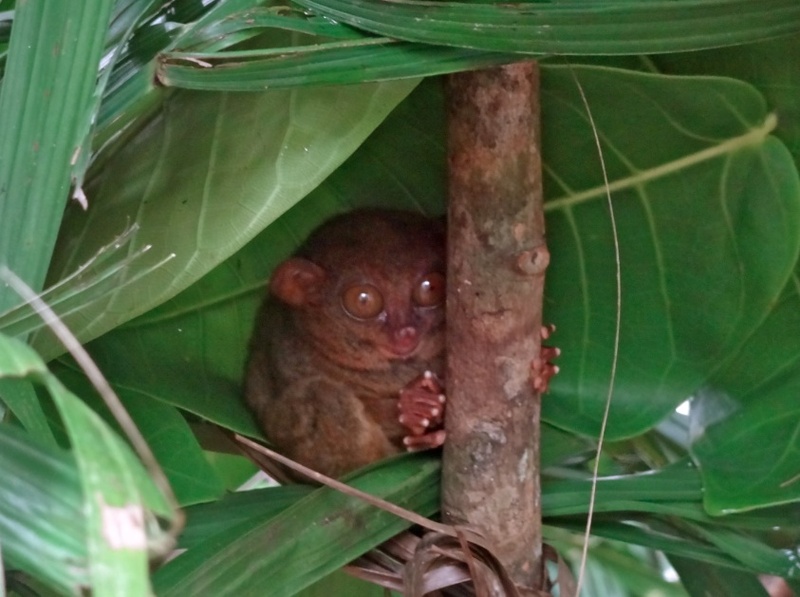 And the Tarsier – what an adorable little creature! We are laying over in the Philippines for a few hours on our way home from our honeymoon (Nepal, then Bali) in September, but I’d love to spend some actual time in Philippines. Nepal and Bali are such great picks! I hope you get to visit the Philippines soon too; seeing the tarsier in person is something else. Adorable little thing indeed. Bohol looks amazing! The tarsier looks like the cutest thing ever! I’ve spent a bit a few weeks in Palawan, but haven’t explored any of the Philippines beyond there. Dreaming of going back someday soon, will have to add Bohol to the list! I’m glad you’re adding Bohol to the list, Christie! How did you like your time in Palawan? I was hardly there for 2 days, most of which was spent at the underground river (which was quite fab though not necessarily worth the LONG journey from the part of the island I was in). Hope to go back someday too! It’s really unfortunate that when the media covers places affected b natural disasters and such, it really plays it up, affecting tourism. I’m glad you’re spreading the word! Interesting, especially the food part. But the whole article gives a nice and different perspective on the Philipines. Or is all of this just exclusive to Bohol? Its an inspiring write-up. I am planning for feb’16 to el-nido, princessa and boracay.Bohol wasn’t in the original iteneary until I read your blog. Any suggestions on areas to stay and the number of days? If I may chime in, try Panglao Island which is part of the province of Bohol. There are several good beaches there like Alona beach and Doljo beach. Where did you stay when you were in Bohol? I stayed in some forgettable hotel, but if I ever go back, I would stay at the little lodge run by the SUPping folks! Hi! Did you go by yourself in the SUP tour? Is the tour pretty safe for a female?im.planning to go solo.. Very well written article about Bohol. Great to see that you loved it here as much as we do. We look forward to your visit again in the near future..MABUHI sa Bohol. How did you stay in phillipines for more than 14 days? Previous PostConfessions of an Indian Digital Nomad. Next PostAirbnb: Why I’m Using it and Why You Should Too.